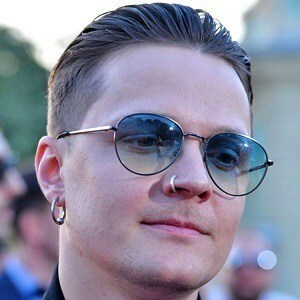 Ukrainian musician and radio presenter best known as the frontman for the rock band O.Torvald. The band represented their home nation in the 2017 Eurovision Song Contest. He also began performing with the long-lived band Skryabin in 2015. He was only five years old when he began taking music classes. His first band, Kruty! Pedali, formed in 1999 and would remain together until 2005, when O.Torvald would be formed. He has presented for a number of TV channels and radio shows including M1 and Prosto Radi.O. He spent the first eight years of his life in Kazakhstan, where his father was serving in the Soviet Army. He has a brother named Andriy. He and his wife, Valeriya, gave birth to their daughter in 2013. He and the rest of O.Torvald competed against Salvador Sobral in the 2017 Eurovision Song Contest.